A Black Country MP has launched a campaign to restore a massive stained glass memorial to Sir Winston Churchill – ready for the 50th anniversary of his death. Ian Austin (Lab Dudley North) wants to restore the tribute to Britain’s wartime leader which once took pride of place in Dudley town centre. Churchill died in January 1965, and Mr Austin said the memorial would be a fitting way to commemorate the 50th anniversary of the death of Britain’s greatest prime minister. The 17 stained glass panels of the memorial were designed by world-renowned artist Edward Bainbridge Copnall and unveiled in 1969. The memorial, in the city centre’s Churchill Precinct, quickly became a popular and iconic local landmark. Damaged first by the weather and then by the vandalism, the panels’ condition deteriorated until they were eventually removed. The remaining panels were then transported to the cellar of Himley Hall where they’ve been gathering dust ever since. Mr Austin said that new techniques developed since the 1960s should mean that the mural can be restored – and protected from the elements. He plans to work with local experts, council officials and residents to bring the idea to life. And he says that the memorial could teach a new generation of youngsters about Churchill’s contribution to securing Britain’s liberty and the world’s freedom. 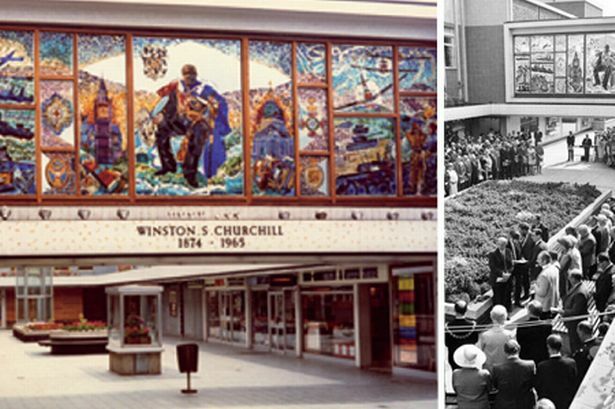 Mr Austin said: “No one who grew up in Dudley could forget the magnificent memorial to Winston Churchill. I can’t remember the number of times I have stood under the panels but I’ll never forget the impact they had on me. “The memorial made me understand how Churchill inspired the British people not just to fight Britain’s liberty, but for the world’s freedom too. Churchill was Prime Minister twice, from 1940 to 1945 and from 1951 to 1955. His stirring words of defiance in the face of the threat from Nazi Germany, including in the earlier stages of the Second World War when victory was far from certain, inspired the nation to keep on fighting. As a backbench MP in the 1930s he was an implacable critic of Prime Minister Neville Chamberlain’s attempts to avoid a war by giving in to some of Adolf Hitler’s demands.